Deposited by Lord Hardinge 1955. 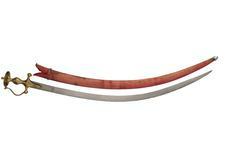 The shamshir blade is curved, single edged and double edged near the tip. The langet is onion shaped. The quillons are short with large knobs. 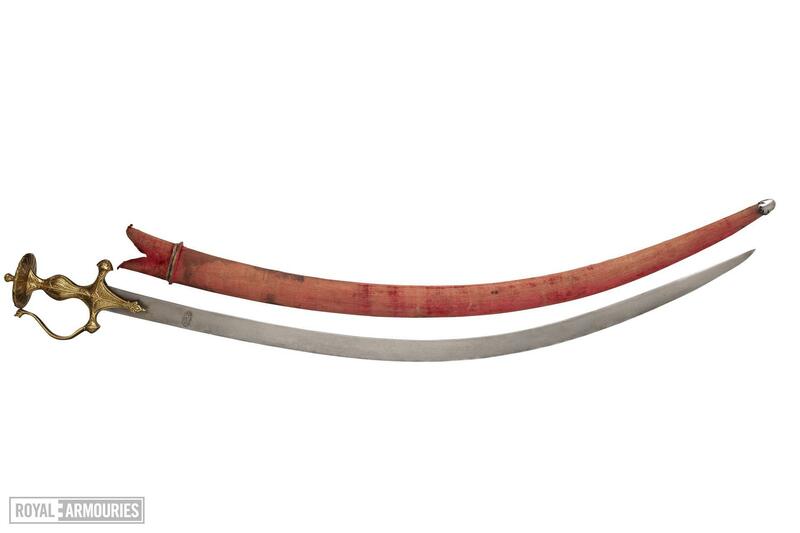 There is an inscription on the inside of the knuckle bow written in Arabic and Hindi. The knuckle bow ends in an animal head finial. The pommel is disc shaped and divided into segments by slightly raised ribs. Small dome over star shaped washer. The hilt is decorated all over with koftgari to give the appearance of gold. The scabbard is wood covered with red velvet, gimp stitching down the centre of one side. The chape is silver with pierced decoration. Dimensions: Length of blade 776 mm. Overall length of sword 903 mm. Length of scabbard 800 mm. _ Weight: Weight of sword 0.910 kg. Weight with scabbard 1.050 kg. Arabic cartouche, surrounded by gold inlaid dots, on blade. Inside the knucklebow is a bilingual inscription in Hindi and Urdu including the date 1216 (AH).